boasts over 12’ of unencumbered cargo space, more than enough room for a Polaris RZR XP 4 1000! 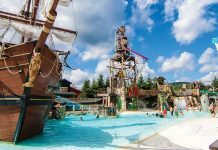 Standard features include a 100-gallon water tank, 40 gallon fuel tank, electric side & rear awnings w/LED lighting, designer interior decors, blue LED accent lighting, A/C, microwave and more! 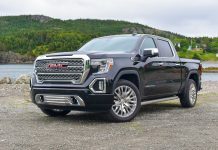 Options include keyless entry, 4K Onan generator, central vacuum, automatic tracking satellite dish, solar panel, roof rack and ramp door patio railing system. 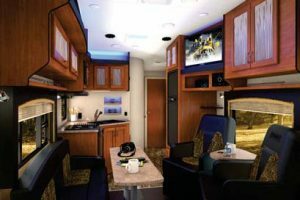 Primetime RV’s Fury 2912X is a toy hauler with the size to take your toys anywhere you want to go. Nearly 34 feet long and 11 feet high, this trailer has space for you and all your toys. With 2,500 lbs. of carrying capacity, this lightweight toy hauler is no pushover. Its hitch weight clocks in at around 790 lbs. 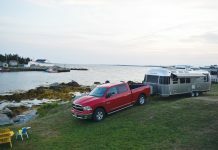 The Fury’s lightweight design and durable laminated construction make it easy to tow, and its available features and equipment will make it feel uniquely your own. The Fury 2912X has an aerodynamic profile and a 12 and a half foot garage. 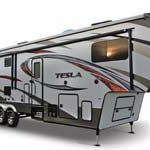 Evergreen RV’s Tesla T3950 toy hauler is everything an RV enthusiast is looking for. At 43-and-a-half feet long and 102 inches wide, the Tesla T3950 is tough enough to cart around your toys, but allows enough comfort to tour the countryside. The Tesla’s Titan 2.0 wide body chassis allows owners of the Tesla T3950 to travel around in style. 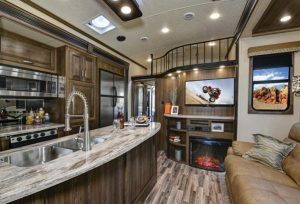 The luxurious interior of this RV includes a fireplace, crown molding ceilings, reclining leather sofas and a 50-inch LED TV in the living room. The Tesla T3950’s GVWR is 21,000 lbs. and has a cargo carry of 4,700 lbs. 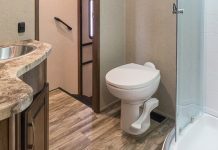 Winnebago Industries’ newest addition to their Fifth Wheel toy hauler offering is the 4014 Scorpion, and it just might be their best one yet. The 4014’s Drop Frame Chassis and Power Rear stabilizer jacks make it stand out from the crowd in a big way. Winnebago’s Sport overall length is an impressive 44’10”, a GVWR of 20,800 lbs. 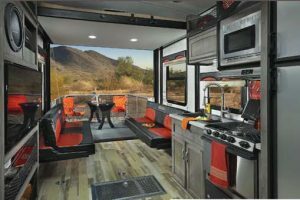 and has more than enough space for the RV enthusiast who wants to travel in comfort while having ample space for all their toys. 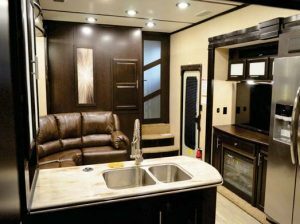 The 4014 Scorpion sleeps ten, has three slideout sections, a 16-foot awning and has an outside hookup for TV and speakers. 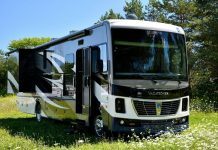 The Spyder 24FQ from Winnebago is a versatile option to suit any traveler’s needs. Its barreled ceiling for extra height gives the Spyder 24FQ an interior height of eight feet and two inches, and an exterior height of just under 12 feet. The Happijac dinette/bed system, tank-less hot water heater and 54-inch residential shower are just some of a long list of amenities and equipment included with the Spyder. The 24FQ’s exterior length is 30 feet and 11 inches, and has a GVWR of 10,400 lbs. It has a built-in toolbox and a walk around queen-bed. 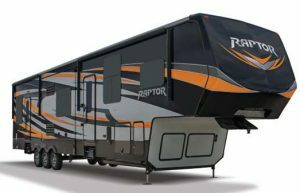 The Raptor 355TS is a 39 feet long fifth-wheel toy hauler from Keystone RV sporting three slideout sections, frameless windows, a six-point automatic level and dual-electric patio awnings. 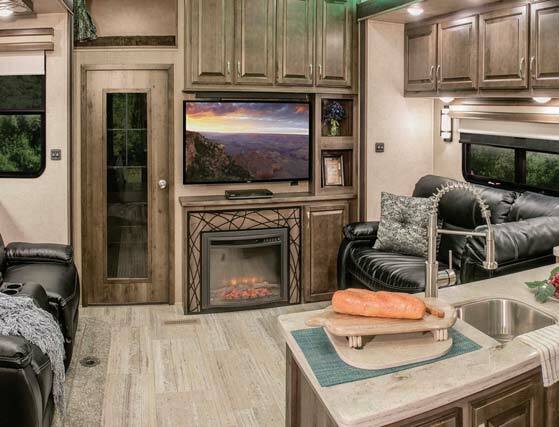 The 11-foot garage includes a drop-down electric-queen bed with opposing sofas, fueling station with dual 30-gallon fuel tanks, welded-to-the-frame tie downs (rated at 5000-pounds capacity) and a rear deck patio that sets up in just minutes. The Raptor is equipped Keystone’s exclusive iN-Command app-based control system, which allows you to control slide rooms, lights, awnings, water heater and pump, plus generator all from your smart phone or tablet using the iN-Command app. 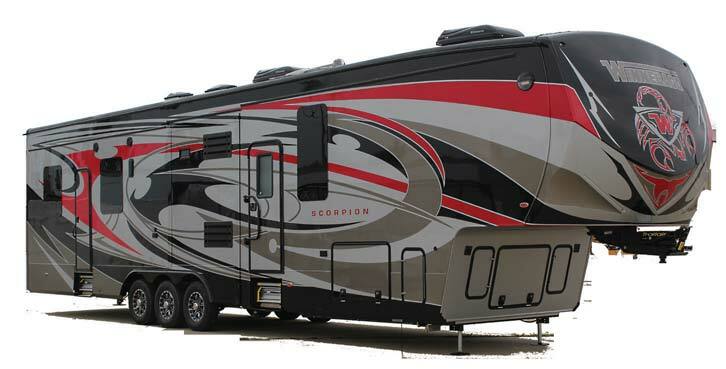 The Venom 3911 from KZ-RV is the perfect blend of traditional RV sensibilities and modern feature-rich toy haulers. 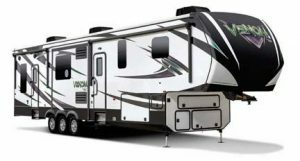 KZ-RV designed the Venom to be a traditional take on a modern day toy hauler. Its wide body and comfortable design allow the RVer to travel in style, and its ETRAK tie-down system, enhanced sound system and silent, efficient air conditioning make it a twenty-first century machine. New to the Venom 3911 was the myRV system tablet. 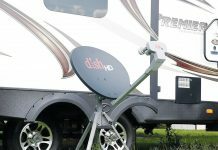 A standard feature in the Venom, the myRV system is a new way of controlling setting and monitoring the status of the RV from one tablet. 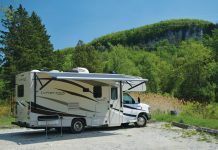 The tablet (included with the RV) connects to the Venom through wi-fi and can control the slidebox, awnings, most of the exterior lights, and the six point hydraulic leveling gear among other things. 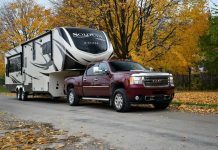 When it comes to reliable light-weight toy haulers Jayco’s Seismic 4250 fifth wheel is definitely on the top of their game! The 7,000 lbs. 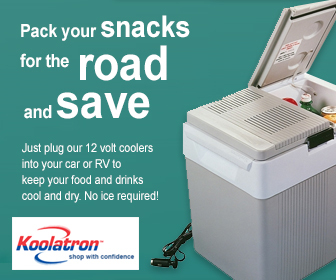 axles will glide you to your destination in comfort with plenty of room for storage. Inside you can enjoy an all stainless steel appliances, air conditioned living room and bedroom, residential corian countertops with genuine stone polished glass backsplash, frameless solar reflective windows, fiberglass sunken tub shower and a 39” LED TV with push button pop up lift system in the bedroom. The 4250 comes with insulated exterior slam baggage doors and beaver tail garage storage. There is standard undercarriage LED light package with app control and an optional exterior tailgater camp kitchen. The Outlaw 37RB is a new take on an old favourite. 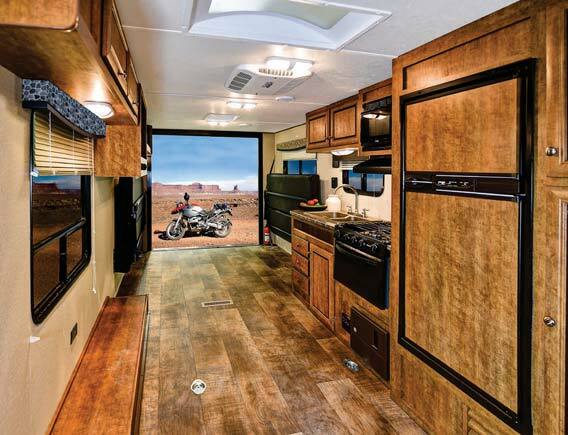 Thor Motor Coach developed the Outlaw 37RB to combine the features of their renowned Class A Motorhomes with the addition of being equipped with a garage in the back. 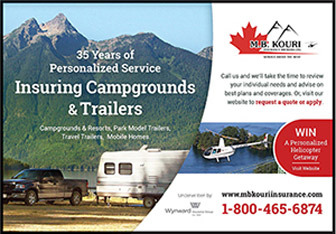 This motorized toy hauler has a second slideout section and a permanent queen sized bed. Like all of Thor’s toy haulers, the 37RB comes equipped with the Rapid Camp system. 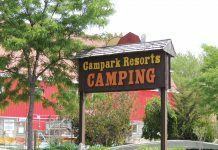 Rapid Camp is a wireless control system allowing users to set up camp at a distance of 50 feet away. 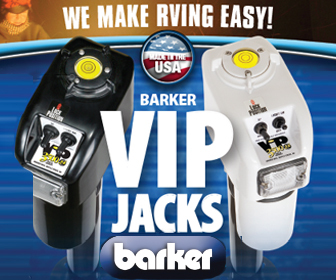 Levelling jacks, slideouts, generator, patio awnings and patio lights can all be controlled through Rapid Camp. 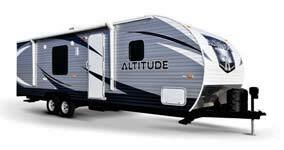 The ATL 225 is one of four toy haulers offered by Crossroads RV, and is a variant of Crossroads TT model. The ATL 225 takes advantage of the TT’s more traditional conventions but is modified with a toy deck on the front of the trailer. 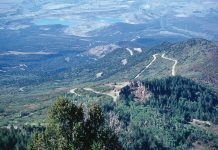 The Altitude SL is a versatile, hearty, comfortable and cost-effective way to experience the outdoors. 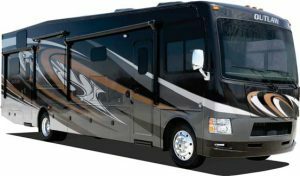 A member of Crossroads’ Action Camping segment, the ATL 225 offers a 17.8 GPH quick-recovery water heater, slideout dinette, and queen bed. 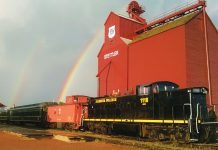 The ATL 225 is measured at 35’11” exterior length and 11’2” exterior height. With a GVWR of 9442 and a hitch weight of only 642 pounds, the ATL is a big trailer that manages to stay light on its feet.